A 48-year-old woman and a 53-year-old man have been found dead at a house in Heiton, Roxburghshire in a suspected murder-suicide. It is believed the man, a field sports enthusiast, shot his partner before turning his gun on himself. See Gun Deaths above, a 48-year-old woman, and a 53-year-old man known to be a keen sports shooter, died in an apparent murder/suicide. A 24-year-old man was lured by friends to a house in Thornton Heath, South London where he was allegedly ambushed by a gang armed with knives and guns, held hostage and forced to phone his parents to demand a ransom. The gang stole the victim’s keys, gained entry to his parents’ home and stole a significant amount of cash and valuables. The victim escaped by running away when his captors drove him to a bank to withdraw money. A senior airfield officer at Heathrow Airport, Greater London, who lost his job after he allegedly pointed a gun at a colleague’s face and carried the cocked weapon around part of the airport, has claimed at a tribunal that he was wrongfully dismissed. The tribunal found the dismissal was not unfair and that several crucial safety rules had been broken. Part of the officer’s job was to shoot birds and vermin on the runway. A 30-year-old man has been jailed for seventeen years after pleading guilty to two counts of possession of an imitation firearm, false imprisonment, wounding, assault occasioning actual bodily harm and criminal damage. During a 24-hour siege at a house in Oldham, Greater Manchester, the perpetrator stabbed a woman in the neck and back, pointed a firearm at an attending police officer and at the head of a child, barricaded himself and the woman in a bedroom where he threatened to kill her, cracked open gas pipes and tried to cause an explosion with a lighter. When officers smashed their way into the house, the perpetrator used the woman as a human shield. The gun was later found to be an imitation revolver. See Armed Domestic Violence (known to perpetrator) above, senior airfield officer dismissed. A 66-year-old gun dealer from Hardwicke, Gloucestershire has been jailed for 30 years after being found guilty of conspiracy to supply firearms and ammunition, smuggling banned Colt handguns into the UK from the United States, possessing a prohibited air pistol and perverting the course of justice by filing down a bullet-making tool to destroy potential evidence. The weapons and ammunition have been linked to 107 crimes, including three murders. Some 50,000 rounds of ammunition and seventeen guns have been recovered but it is thought that more than 200 weapons are still in circulation. The perpetrator claimed the weapons he imported were obsolete antiques in order to sidestep import rules, leading the judge to call for tighter firearms regulations. A 45-year-old man has been banned from owning firearms after pleading guilty to a charge of failing to comply with the conditions of a shotgun certificate. Bailiffs attending his address in Coniston, Cumbria found the front door unlocked and discovered two guns in the kitchen. A third shotgun was with a firearms dealer as it was to be sold. The man was ordered to carry out 60 hours of unpaid work and to pay a victim surcharge of £85 and court costs of £85. The forfeiture and destruction of the three shotguns and ammunition was also ordered. A 71-year-old man has been fined £900 after pleading guilty to possessing a firearm and 140 rounds of ammunition illegally. He was arrested after police discovered a revolver in the attic of his home in Gauldry, Fife. The man surrendered his shotgun and firearms certificates but claimed his father had been given the gun by a French man during military service in the Second World War. The judge said that the man had demonstrated a responsible use of firearms in the past and that the minimum sentence of five years would be disproportionate given the perpetrator’s age and the fact that he was on medication. Thieves allegedly stole a locked safe containing live rifle ammunition from a house in Heanor, Derbyshire. The bullets were owned by a person who has a firearms licence. We are aware of at least two reports in December 2017 of stolen guns and ammunition. See Licensed Gun Owners/Dealers/Legal Guns and Ammunition above, and a 39-year-old man has been jailed for eighteen months after admitting one count of burglary at a property in Oxford, Oxfordshire where he broke into a bungalow while high on drugs and stole a laptop, an air rifle, a gun bag, a telescopic sight and ammunition. A cat has been injured after reportedly being shot with an airgun in the back garden of his owner’s house in Croydon, South London. A male swan has died from a puncture wound in the head and a female swan suffered severe injuries to her neck after being shot with an airgun in Clayton-le-Moors, Lancashire. Imitation, Airsoft, and BB guns do not currently require a licence in England or Wales. These guns are responsible for many gun injuries to both humans and animals. Since January 2017 airgun owners in Scotland have been required to have a licence. A 25-year-old man from Dundee, Scotland, has been jailed for fourteen months after admitting a charge of assault. He claimed that he held a BB gun against a woman’s head and pointed it at her friend as a practical joke. Four men have been found guilty of conspiracy to murder. Their victim, who was not the intended target, suffered a wound to his leg when a sawn-off shotgun was discharged through the letterbox of a flat in South Oxhey, Hertfordshire. Two men have received sentences of life imprisonment and ten years, five months respectively after each being found guilty of two offences of possession of a firearm and one of possession of ammunition with intent to cause fear of violence. Undercover police officers in Leeds, West Yorkshire observed the suspects exchanging a loaded semi-automatic pistol and silencer. It is believed that the weapon was intended for use in a revenge turf war attack. A 72-year-old man has been jailed for ten months after pleading guilty to one count of possessing a shotgun without a certificate. The man had initially been detained on suspicion of murder after he used a double-barrelled shotgun to shoot dead a 48-year-old male intruder who tried to enter his static home near Colnbrook, Berkshire in June 2017. A 28-year-old man from Plymouth, Devon has been jailed for eighteen months after pleading guilty to possessing a BB gun with intent to cause fear of violence and to having an air rifle while prohibited, having been previously handed a suspended prison sentence. A 30-year-old man has been jailed for twenty years and ten months after pleading guilty to possession of drugs with intent to supply along with possession of firearms and ammunition. During searches of the man’s home in Smethwick, West Midlands, his car and linked properties, police seized over £50,000 in cash, heroin worth over £1.7million, cocaine, spice and eight firearms including a shotgun, a revolver, a pistol and Tasers, along with 200 rounds of ammunition. A 24-year-old man has been jailed for nine years after admitting to possession of a firearm, possession with intent to supply cocaine, conspiracy to supply cannabis, dangerous driving and two drugs possession charges. The man fled from his car when police tried to speak with him at a service station in Wigan, Greater Manchester. Officers discovered a German-made revolver hidden in his car and he was arrested at his grandparents’ home the following day. A 44-year-old man has been handed a prison sentence of six years after pleading guilty to five charges under the Firearms Act. The man drove away from police arriving at his home on an unrelated matter, but his car was traced and stopped in Glasgow, Scotland, where police officers recovered a pistol magazine and silencer from the vehicle. Many incidents involve the use of airguns*, Airsoft, imitation, and BB guns, which do not require a licence and may not contain ammunition, but are used by perpetrators to capitalise on the fear of victims who believe they are about to be shot. 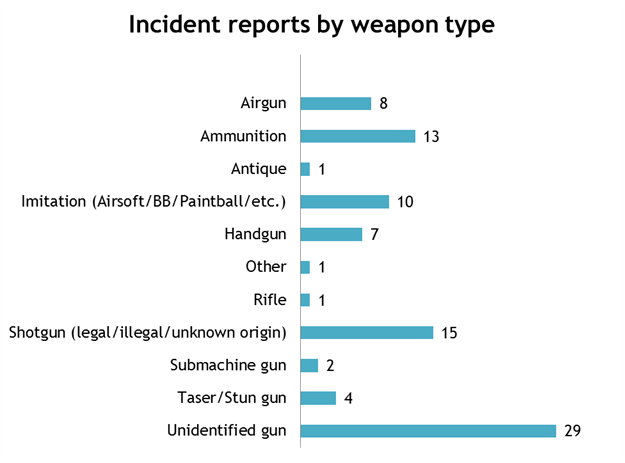 Traumatised victims are often unable to identify the weapons used. It is extremely difficult to distinguish between imitations and live-firing guns unless the weapons are fired and/or recovered, and for this reason guns involved in incidents frequently remain unidentified. Shotguns and rifles can be legally held by those granted a licence. Ultimately, legally-obtained guns in every country tend to find their way into the wrong hands, whether through theft, corrupt licensed gun dealers, (see above Licensed Gun Owners/Dealers/Legal Guns and Ammunition) and/or the failure of the licensing procedure to identify legal gun owners who pose a risk to themselves and/or others, (see Gun Deaths above, a 48-year-old woman. and a 53-year-old man, a keen sports shooter, died in an apparent murder-suicide). These guns are cheap, accessible, and available to buy on impulse. Moreover, lack of secure storage requirements enables theft. (See above Stolen Guns and Ammunition). Many are capable of being converted into more powerful weapons. Guns deactivated to early specifications are capable of reactivation and recent more rigorous specifications are not retrospective. However, the Home Office does not publish data regarding the number of licensed guns/legal gun owners involved in crime, and the status of guns used in suicides is not recorded at inquests.